Your front door is one of the first things someone will notice about your home. DFW Finishers are your complete wood door refinishing specialists. 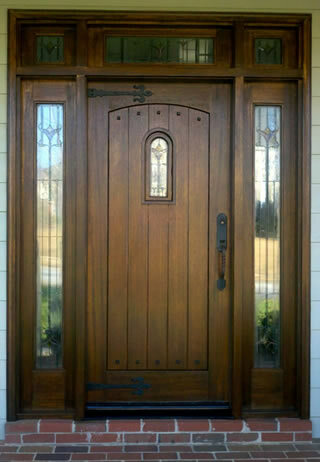 All wood doors require attention on a regular basis due to the UV rays of the sun, water, mold, and mildew. DFW Finishers can either provide you with a refinishing service or a maintenance service. Refinishing includes chemically removing the finish of your door. The door is then sanded, stained the color of your choice, and 3 coats of clear exterior finish are applied. This will make the door “like new” again. Once a door is restored to “like new” condition then regular maintenance should be performed to extend the life of your newly refinished door. Wood doors should be maintained on a regular basis; the trick is to do maintenance before significant damage has occurred. Maintenance includes a light cleaning and sanding, then the application of a new coat of finish to the surface of your door. DFW Finishers can provide your maintenance service with no hassles and excellent service. We recommend that you do a maintenance on your wood door every year to ensure its beauty and protection; some doors may require bi-annual maintenance due to exposure to the sun and elements. If you keep up with the maintenance of your door, it can be done for a fraction of the initial cost. DFW Finishers of Holly Springs, NC are: Experienced professionals at door refinishing including wood doors, front entry doors, and wood door refurbishing; and a Professional door restoration and refinishing company in the Raleigh, NC area. We service the areas of Holly Springs, Apex, Cary, Fuquay-Varina, Morrisville, Raleigh, Durham, and Garner, NC.